We all know that inboxes are more crowded than the bathrooms at NOLA during an open call. Email marketing, however, is one of our best communications tools as professional freelancers. With limited administrative time on your hands, it is imperative to make your eblasts efficient and effective. Email marketing is such a great tool for singers because it is affordable, quick, user-friendly, direct, personal, and even more importantly – it’s measurable. But, it only works if your emails get opened! Your Day 11 challenge is Make Email Marketing Work for You. Have you ever been working intensively on a creative project only to be frustrated in conversation with a close friend who seems to have no idea you are even working on something? How would they know? Do you expect that they are hawking the calendar on your website every chance they get? Hint: they are not. The internet allows for both passive and active marketing. The passive element requires updating your website regularly and generically posting on social media. To actively engage your audience/fan base you need to meet them where they are – their inbox. First, find an email service that meets your needs. There are many. I highly recommend mailchimp.com but feel free to search around for the one you like the best. Research the plans the service provider offers including options like how many and how often you can send emails as well as any restrictions on subscriber lists. Your subscriber list should grow over time as you increase your fan base. Make sure it is easy to subscribe to your email list via your website, email signature, social media channels, or even in your program bio. You could include a permalink to the subscriber page on your business card in addition to your website. Ultimately, just remember to ask regularly, “may I add you to my email list?” Once they give you permission, do not confuse them with the “from line” in your emails. It should include your full name and a recognizable domain. Also, this is not a set-it-and-forget-it kind of list. Monitor your full subscriber list regularly to remove duplicate, bounced, and/or blocked addresses. Finally, do not hide your “unsubscribe” button. That does not generate any good will. When you send your eblasts is crucial to their success. Pay close attention to the open response you receive from a cross-section of your recent emails to see the times that work best for your audience. Open rates are traditionally higher during the middle of the week and between 8am-12pm. First, begin with your goal in mind. Second, remember your three branding words from yesterday’s digital press kit challenge? Your email marketing is another opportunity to share your personality with your ardent supporters. Communicate clearly and concisely. Remember there is a reader on the other end of your email. Engaging content is about creating value for that specific reader. Sure, your mission is to tell potential audience members about an upcoming performance. That is only going to get you so far – even with your supporters. Go back to your market analysis and consider the values, needs, and desires of your audience. Your goal is to enhance their life not to spam their inbox. When including upcoming events in your emails, include specific details: event title, performer names, date, time, location, and ticket purchase link. Place the most important information in your email in the first paragraph. This isn’t a novel – it’s an eblast. Think of the “pre-header” as a secondary subject line. Avoid the stock text “Can’t read this email? View on web” and offer a quick shot of value. The pre-header may show up as the preview in their inbox. What do you want your subscriber to do after reading your email? Do not be subtle about it. Reconsider sending the email if you do not have a strong “call now” or “buy your tickets today” message. Your call to action with your details works best above the scroll. Does the design of the email lead your eye to the call to action? It should. Use an upcoming performance to your advantage to create a sense of urgency. Just like your digital press kit, keep your logo (if you use one) and your colors consistent in your email marketing. Endeavor to find a template that coordinates with your website that you can use repeatedly to build recognition with your fans. Make sure that you are creating eblasts that are mobile-friendly. Responsive design is an important consideration so all your fans can read your emails on their preferred device. For your sanity and your reader’s, use a single column format and keep the design simple and sharp. Optimize the “alt text” on your images in case a reader’s email client does not display your image by default. Always, always, always check your links. Before you hit send, think about the “shareability” of your eblast. Is it clear to your supporters how they can help spread the news? Using social media should really help you reach beyond your first level connections to your fan’s connections or farther if your content is compelling enough. Add social share buttons to your campaigns and monitor their use to see what gets traction. Would you be glad you got your own email? Know how tailoring is so great once you finally do it? Use the information in your campaign reports to tailor your lists and emails for more efficiency. Group your subscribers by the time and day of the week they are most likely to open your emails. Also, investigate your top clicks. What do you think persuaded them to click there? Your results will help you write better copy, create a stronger call to action, and learn how to segment your lists. There is no magic formula but email marketing is something that you can add to your promotional materials in an effective and efficient way. It is your job to bring audiences to your performances and a strong email list will certainly help you. Have a favorite eblast design or story to share with the crew? Tell everyone about it in the comments below! Sharing your latest email newsletter on Twitter? Don’t be shy, tweet me @mezzoihnen. I want to read about your adventures in the Diva Life! Informative & inspiring as always! I recently had a talk with my teacher and some of my colleagues about the professional and innovative attitude of American singers. Sometimes it can drive me insane how things function differently here in Europe (and especially if you go further to the eastern side). Can you imagine that in Serbia (where I am from), everyone laughs at me for having and giving my business cards. None of my Serbian colleagues even has a professional photo and let alone their web site or press material. Very few of my Dutch colleagues have one too. I just don’t get how they do not see the importance and value of utilizing all the benefits of digital era in building up our careers. In 2012 I got a book written by Angela Myles Beeching called ‘Beyond Talent’ (maybe you know it too). 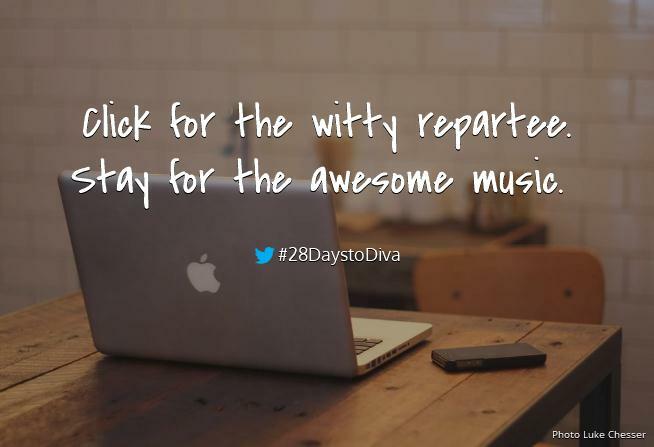 I wholeheartedly recommend it to all Divas as a great career resource and addition to #28DaystoDiva. Keep up with the great work! Wow! Laughing at you for handing out business cards? What a difference!! “Beyond Talent” is a great resource! Thank you for reminding me. I’ll have to go back and re-read. I would love to hear more about your Diva experience in Serbia! It sounds incredible.